Looking for an easy and thoughtful Thanksgiving Day activity for your students? 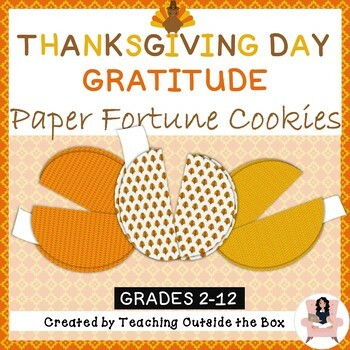 These paper gratitude cookies are folded to look like real fortune cookies with a blank insert for personalized thank you notes. 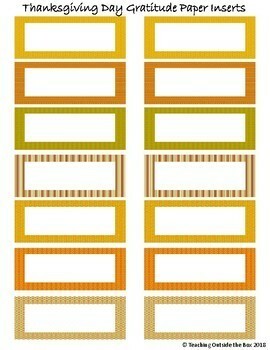 They are perfect for giving to your students or having them give to each other! Some examples of messages students can write to each other include things like: "Thank you for sitting next to me on the bus," "Thank you for sticking up for me at lunch today," and "Thank you for studying for that test with me." 1) Simple instructions on how to make the Thanksgiving Day gratitude cookies with accompanying pictures. 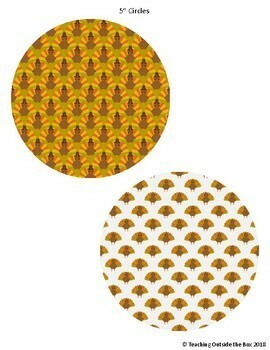 2) Small (3.5") circles and large (5") circles which students will fold to look like fortune cookies and blank paper inserts for students to write their thank you messages. 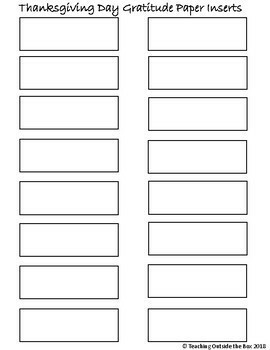 4) In addition, there are blank circles templates for students that wish to color and decorate their own gratitude cookies. Have students exchange gratitude cookies and collect them in Thanksgiving Day decorated bags, containers, or even Chinese take-out boxes! Be sure to Follow Me on TPT and Pinterest !